I am sharing pictures of Christmas Trees I have decorated in our homes over the years. I hope you enjoy them and get some ideas for your next tree. This tree in our prior home is one of my favorites. It is also a very popular pin on Pintrest HERE. 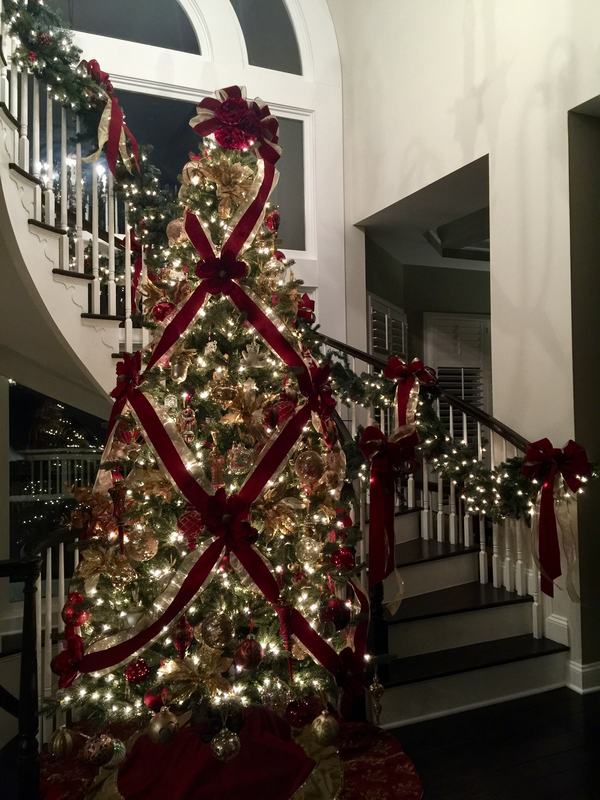 It is a 10 foot tree decorated with burgundy and gold ribbon in a criss cross pattern. I added garland to the rails and it looks just beautiful. The garland is loosely draped on the banister and tied with bows. If you’re interested in changing the look of your stairs, check out How to Re-Stain Stairs & Railings and Paint Stair Risers White. I used a similar criss cross pattern for this flocked tree and added red ornaments. This 10 foot tree has a nature inspired theme. You can see more pictures in this post Winter Dinner Party for 12 – Table Ideas. Once upon a time this 7.5 foot tree sat in our sunroom, but I felt it was too small for the space. This picture was taken before we painted the room, check out “Modern French Country Christmas” Sunroom Tour and Remodel for more before pictures of the space. Another year we moved this tree into the family room which was a better fit but still not perfect. This year I didn’t use this tree in my decor at all, I feel it’s a bit small for most of our rooms. The same tree in our family room at nighttime. A 12 ft tree in our foyer fits the space perfectly. I used ribbon in a zig zag pattern on the tree and lighted garland graced the bannister. The ribbon on the bannister matches the ribbon on the tree. This tree holds all our family ornaments, collected over the years. The family room tree and the kitchen tree can be seen in the background from the foyer. Our flocked tree lived in the sunroom last year. But I like it better in the kitchen 🙂 For more information about this tree, you may be interested in Tips and Ideas for Decorating a Flocked Christmas Tree 2018. This tree lived in our kitchen one year. This year, we had 2 trees in the sunroom, one on each side of the fireplace. I really like this set up. For more pictures check out Sunroom Christmas Tour. Also this year, I used 2 trees in the foyer, a 10 ft and a 12 ft side by side. I already have ideas for next year on switching these trees up..I love trying new ideas and changing things around. How about you, do you like trying different arrangements or do you stick with what works for you? For more Christmas tree ideas, check out White House Christmas Tour 2018. Merry Merry Christmas to you all! I am so happy to share my ideas, tips and tricks with you. Wishing you and your family the very best holiday and I look forward to bringing you many more posts and inspiring you to create your best home. You can also get daily inspiration and follow along on Instagram HERE. Make sure to check out my Instagram stories too!